Charles Wallace, a great business writer, gave me and Dividend Stocks for Dummies a nice write up in his AOL Daily Finance piece on where to invest in a rocky market. I mention a few stocks posting yields much higher than bonds, as well as Utiities Select Spider Fund (XLU), which currently yields 4.1% or 52% more than the 10-year Treasury. For the full article go to DailyFinance. I will be speaking this coming Sunday (7/25) on New York Radio, AM-710 (WOR) from 10 a.m. to 11 a.m. I will be on The Index Investing Show with Ron DeLegge. To hear live on the Internet go to http://www.wor710.com/. I will be discussing the book Dividend Stocks for Dummies. I will also address the ETFs that track dividend-based indexes, WisdomTree. Lawrence Carrel, author of “Dividend Stocks for Dummies,” advocates for dividend-heavy portfolios, saying volatile markets are a ripe time to pick paying stocks. With stock values unpredictable, investors find comfort in knowing that they will at least be paid the dividend even if they lose out on stock value, he said. In his book, Carrel outlines several myths that investors harbor about dividend-paying stocks. On the contrary, Carrel sees rocky times as the right time to invest in stocks where you can recoup profits without selling the shares. For the full article go to MarketWatch. 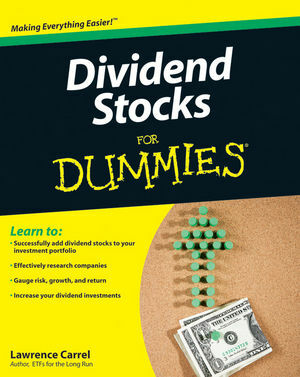 Dividend Stocks for Dummies gets some notice in Canada. Why? Dividend-paying stocks offer the promise of growing their dividends at or beyond the rate of inflation. He says, and so do I, that, such a move to dividend stocks will reap an unexpected bonus: unsought capital gains for the stocks boomers choose — merely because of a growing demand for a finite number of decent-yielding stocks. Investors are advised to “spread their money across the major economic sectors. Conveniently, those sectors each get a chapter in Part III of the book: Exploring Income-Generating Industries. This is the most interesting section, with chapters devoted to each of utility stocks, energy, telecommunications, consumer goods, and financial stocks (in which he lumps in REITs). “Each ends with a list of stocks Carrel suggests should be “considered,” complete with ticker symbol, dividend and annual yield as of the end of 2009, listed in descending order by yield. Carrel explains the ins and outs of cyclical stocks and how they behave as the economic cycle progresses, and under different interest rate scenarios. His 13 financial stocks include four of Canada’s big banks: all but BMO. His list of 12 telecom stocks includes BCE, whose dividend is 6.3%. In addition, a half-page sidebar is devoted to Canada’s royalty trusts and income trusts. Because they’re losing their tax-free status in 2011, Carrel’s recommendation is to “pass” on royalty trusts. But it’s the sectors NOT represented in Canada, such as consumer goods, that Canadians should focus on. He lists 26 consumer goods firms, with yields from a low of 2.5% for Hasbro to a high of 11.4% for Vector Group. The Pittsburgh Post-Gazette published a story about dividend investing today. Dividend Stocks for Dummies was mentioned and I was quoted. The Post says, “Retirement is supposed to be about financial security, which explains why many senior citizens are leery of putting too much faith in an up-and-down stock market. But safe investments, such as bank CDs and government bonds, hardly provide enough income to keep up with inflation. Larry Carrel, author of “Dividend Stocks for Dummies,” said in the past most stocks paid dividends but dividends fell out of fashion when investors focused on companies that had greater potential for capital appreciation. During the Ronald Reagan administration, he said, tax laws were changed so that capital gains were taxed at a lower rate than dividends. “So people decided it was better to focus on stock price appreciation because those profits were taxed as capital gains, while dividends were taxed at the same rate as ordinary income,” Mr. Carrel said. “That was the main reason a lot of companies stopped paying dividends. But in 2003 during the George W. Bush administration, the dividend tax was cut to 15 percent, which was the same rate as the capital gains tax, putting dividends and capital gains on a level playing field. Today, about 72 percent of stocks on the S&P 500 Index pay dividends, Mr. Carrel said. The Pittsburgh Post-Gazette story doesn’t mention ETFs, but I will. A great way to get the advantages of dividend investing with ETFs is by purchasing ETFs from WisdomTree. Every ETF launched by WisdomTree tracks an index weighted by dividend payments. This means every single stock in their funds, domestic and international, pays a dividend. I will be speaking about Dividend Stocks for Dummies on the radio and Web tomorrow, Wednesday, May 12. It will be broadcast on 1510 KFNN Financial Newsradio in Phoenix, Ariz. about 9:24 a.m. Eastern Time and 6:24 a.m. on the west coast. You can also hear it on the Web at KFNN.com.